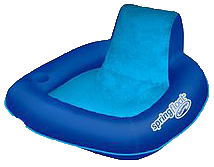 Monarch Pools & Spas has over 80 styles of the newest pool floats and rafts! Hourglass-shaped, sling-style fabric bed and framed footrest provide secure comfort. Easily assembles in one of two custom positions – upright or reclined. Over-sized pillow adds padding and support for your head and neck. Lightweight aluminum frame in mill finish provides lasting stability. Relax in perfect harmony with the water on the SwimWays Elluna Lounge. The contemporary elliptical design is adorned with a simple floral imprint and complimenting pontoons on either side. The mesh fabric bed is breathable Textilene fabric for superior comfort and cooling as you float partially submerged in the water. This luxury pool lounge has an oversized, adjustable headrest pillow for added comfort and two integrated drink holders for convenience, resulting in the perfect drifting experience on warm summer days. Contemporary elliptical design pool lounger. Breathable, Textilene® mesh fabric bed is fade resistant. Integrated backrest, headrest, cup holder and ottoman. Mesh seat keeps you cool. 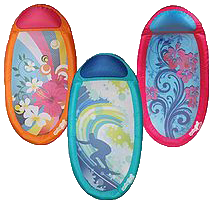 Fabric-covered inflation for comfort and added durability. 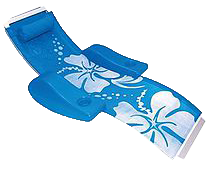 Patented inner spring adds stability in the water. Inflates/deflates easily with Jet Valve Technology – no air pump required! Folds flat for storage and convenient portability. Weight capacity: For adults up to 250 lb (113 kg). 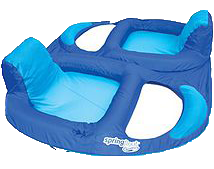 Instantly escape the hurry of everyday life with the original SwimWays Spring Float! Within minutes, you’ll be luxuriating in soothing mesh that envelops your body for the ultimate pool reclining experience. Soft, soothing mesh hammock bed with oversized inflatable pillow. Folds flat for storage and convenient portability in the included carry tote. 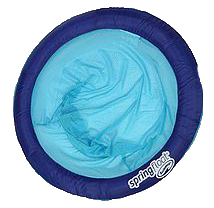 Outer ring and pillow inflates/deflates easily with Jet Valve Technology – no air pump required! Weight capacity: For adults up to 250 lbs. (113 kg). Graphics on mesh bed won’t peel off thanks to our heat-and-press process. 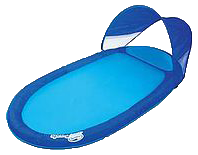 The SwimWays Spring Float Papasan floating pool chair has all the awesome features of the Spring Float line of pool floats in a smaller, sit-up style for easy conversation with friends. Soothing mesh papasan-style seat provides the ultimate in comfort. Outer ring inflates/deflates easily with Jet Valve Technology – no air pump required. 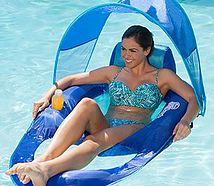 Small enough to fit inside a small suitcase when folded – it’s the ultimate travel pool float! Weight capacity: Adults up to 250 lb (113 kg). 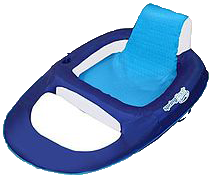 The SwimWays Spring Float SunSeat is the ultimate floating chair! With comfortable fabric-covered inflation, backrest, cup holder, and comfort mesh seat. Integrated backrest, headrest, and cup holder. 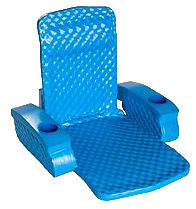 Comfort mesh seat keeps you cool. Weight capacity: For adults up to 250 lbs (113 kg). 2 integrated backrests, headrests, cup holders and ottomans. Comfort mesh seats keep you both cool. Full hammock bed with reinforced construction. Durable heavy duty fabric-covered inflation. Inflate/deflate easily with Jet Valve technology. Also available in size large for dogs 65 pounds and up. 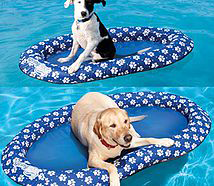 Small size accommodates dogs up to 65 pounds. Polyform flotation arms support up to 275 lbs. With its built-in headrest, extra-wide seat, oversized arms and recessed beverage holders, this luxurious float will become everyone’s favorite. Time will stand still as you relax in comfort. Just turn the two knobs to adjust your angle of comfort as an upright chair, lounger, flat full-length float, or any position in between. Double thick layers of Super Soft® vinyl coated foam work together with an internal steel frame that provides years of durability.. Size measures approximately 60” long and 32” wide. One year warranty for manufacturing defects only. 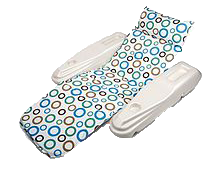 Full circle pillow for extra buoyancy, long lasting and durable.